2. Allowances related to maintenance, washing of- Uniform are subsumed in Dress Allowance and will not be payable seperately. 4. 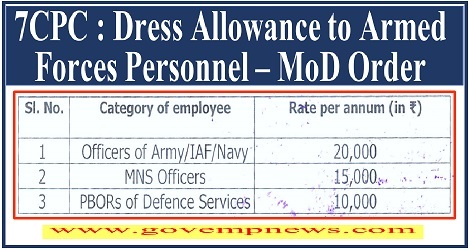 The amount of Dress Allowance shall be credited to the salary of employees directly once a year in the month of July. 5. This allowance covers only the basic uniform of the employees. Any special clothing like that provided at Siachen Glacier or inside submarine 'win continue to be provided as per existing norms. 7. The rate of Dress Allowance will go up by 25 percent each time Dearness Allowance rises by-50 percent. 8. These orders shall take effect from 1st July, 2017. 9.This issues with the concurrence of the Ministry of Defence (Finance) vide their Diary No. 446/AG/PD dated 05.10.2017.